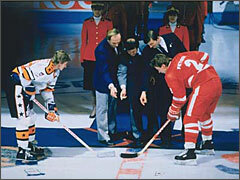 In February of 1987, for the second time in its history, the annual National Hockey League All-Star Game was replaced by an exhibition challenge between its stars and those from the Soviet Union. 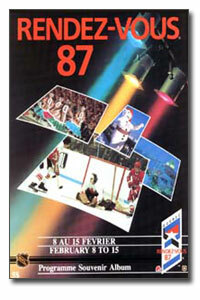 The two-game series in Quebec City, Quebec, pitted the Soviet National Team against a squad of NHL All-Stars. As with the previous Challenge Cup in 1979, the North American fans had the chance to vote on the starting line-up for the NHL squad. A triumvirate of General Managers, Glen Sather, Serge Savard and Bob Pulford, rounded out the rest of the team that would face the powerful Soviet squad. Game one was a hard-fought, edge-of-the-seat battle. Despite the presence of the veteran superstars from the Edmonton Oilers, 21 year old Mario Lemieux set-up the winning goal in a 4-3 NHL victory. The second game was again a close affair, however, the Soviets took control with the help of their young star, 20 year old Valeri Kamensky, who scored a hat trick en route to a 5-3 Soviet victory. The series ended in a 1-1 split, thus proving the parity that existed between North American and Soviet hockey. Click on a team below to see its roster and stats.